At Rowing The World TM, we have a philosophy of partnership and collaboration. Many of our trips are guided by local rowers. Meet our team! Russian born, Anastasia is a University of Manitoba Master’s grad, focusing on studying community tourism development. 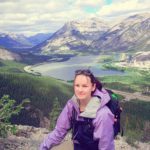 She travelled around the world before settling in Canada, and now she enjoys bringing her international background and education into creating memorable travel experience for others. Since inception in 2013, Fit Communications has been dedicated to building stronger and healthier communities across Canada. Healthy Bodies. Healthy Minds. Healthy Communities. We are committed to strengthening individuals and their communities through positive action. While working in sport in various capacities for over two decades, we have managed to have a deep understanding of how the sport world works in Manitoba and across Canada. We are very passionate about introducing sport to young girls, ensuring they stay in sport, and have as much success as their male counterparts. We develop intelligent, strategic marketing and communications plans and tactical solutions to help businesses and organizations reach the next level of excellence. We listen. We partner. We share your passion and your dreams. We love what we do and it shows in our work. For over 15 years, Christine has been bridging the gap between business and technology, making the web simple for organizations looking to maximize their online visibility. 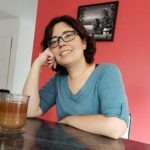 Starting out as a web developer, she worked her way into project management and business analyst roles. She wanted to turn her passion for web technology and customer service into further serving businesses and so, in 2014, she started The Web Gecko. The Web Gecko provides professionally designed websites that attract and engage your target audience along with powerful web marketing strategies that get you noticed on the web. We are your partner in success. Cathy Senecal is Rowing The World’s content strategist. Amassing a career of pushing boundaries through global media relations strategy in domestic and international markets, Cathy Senecal has mastered content and now advises destination and experiential entities on rich media relations and content strategy by combining curiosity, tourism experience and boundless creativity. When she isn’t busy with her company, Senecal Travel Marketing & PR, she is travelling or writing, something she did as a freelance writer in the 90s. Cathy has travelled to every continent and has visited more than 40 countries, covering culture, outdoor adventure and wildlife experiences. She authored the bestselling wildlife book Pelicans to Polar Bears, and has written hundreds of articles for dozens of outlets including The Washington Post, The Globe & Mail, enRoute, Michelin Guides, Reader’s Digest Atlas and Expedia.ca. Michele, or Mich, lives in Pescallo di Bellagio. 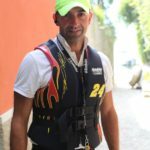 He has a long career rowing on Lake Como and throughout Europe, having competed on the Italian national team. His love for his beautiful part of the world inspired him to create Bellagio Water Sports, offering kayaking day excursions. Viv has been rowing since 1994. She is a member of Weybridge Ladies ARC which is situated in Surrey at the southernmost point of the River Thames. The club was formed in 1926 by pioneer of women’s rowing; Amy Gentry and is now supported and sustained by the members who are extremely proud of the club’s history. 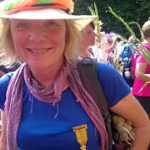 Viv has held a number of key roles on the club committee over the years including Vice Captain, and is currently Regatta secretary and a British Rowing qualified coach. Viv has participated in the Vogalonga in Venice, in both rowing boats and dragon boats. 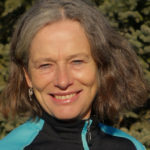 She has taken part in rowing tours and events in France, Germany and Finland and on home waters enjoys rowing and coxing in long distance races such as the Head of the Dart in Devon and the Great River Race in London and has enthusiastically shared these experiences by organizing the participation of her club crews in many of these events. One of her favourite rows ever, has been as a member of the crew rowing the Queen’s Row Barge; ‘Gloriana’. Such a privilege. In the summer months when not on the water either rowing or coxing, Viv can be found in the water enjoying a bracing river swim, (voluntarily, not because she has fallen out of a boat!) she also enjoys walking, cycling and the theatre. 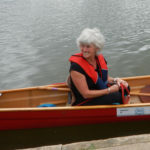 Viv met Ruth on a British Rowing tour in Gloucestershire in 2014 and discovered they shared a passion for touring rowing and ensuring that others could also enjoy the sport away from their local area. Viv has helped as a guide for the Classic Thames Tour for the past two years. I am passionate about rowing and have been involved in the sport since high school. I am currently Captain of Alfred RC in Cape Town South Africa. I love touring & coastal rowing as well as competing at masters level. I am proud to hold two South Africa masters records. Enjoying tours with international guests is always a delight as friendships are formed around the common interest of rowing. Blessed with having a family seaside cottage at the Boulders, Geordie has been drawn to the sea from an early age. He has fished, snorkeled, canoed, sailed and windsurfed there most of his life. Along with extensive sailing on keelboats, particularly in the Greek islands, Croatia, France, Spain and Malta, he has sailed across the Atlantic on a 72-foot yacht from Palma, Majorca to the island of Antigua. Geordie also has 20 years’ experience sea kayaking and has even built kayaks for himself and his daughter. Rowing came into his life six years ago. He pioneered the start of Coastal Rowing at Simonstown with his brother’s Virus single/double from France. 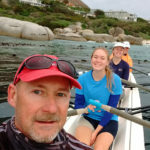 A group of keen rowers have now formed a club called Cape Coastal Rowing Club incorporating with the False Bay Yacht Club. Besides rowing around Simonstown, Geordie takes weekend trips up the West Coast for the spectacular spring flower and migrant wader bird row, along with Hermanus and Stanford for the whale sightings, and the Breede river and Berg river rows. He also leads day trips to Millers Point, Robben Island, Cape Point and Hout Bay. All showcasing the beautiful and diverse unspoilt jewel of South Africa. 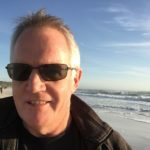 Dave is commodore of Cape Coastal Rowing Club, and when he isn’t on the waters of False Bay either rowing or coaching he is regional editor of a group of financial publications. Rower, walker, jewellery designer, knitter, granny. I learnt to row on the Thames just over ten years ago and wish I’d found the water earlier. I love all the time I spend on the water, racing, training, touring, chilling with the ducks in the sunshine. Really looking forward to showing off ‘my’ river. 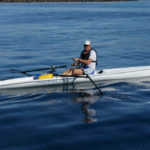 Brian Roberts has been involved in rowing for 35 years. Originally a cox with Trinity College Dublin Brian went on to win Senior Irish Championships in the eight and also represented Ireland, coxing the winning eight in the 1981 Home Internationals, as well as competing in many and varied watercourses from Henley on Thames to the Festival of Oars on the Nile in Cairo and Luxor. In a strange twist of fate Brian later coxed the winning Adelaide University four in the 1987 South Australian state championships. 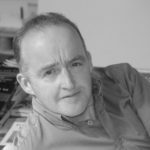 Brian and his wife Brigid established their business at Waterside guesthouse and restaurant in Graiguenamanagh in 1998. Missing rowing so much Brian decided to establish his own rowing club in Graiguenamanagh. Now in its 15th year Graiguenamanagh boasts 70 active rowing members and Brian Roberts still heads up the club as Captain and coach. Since boyhood he “belongs” to Rowing, a discipline that has seen him covering a multitude of roles. 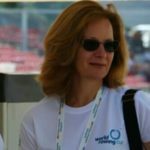 From athlete, to coach, to rowing club president, to local Italian Olympic Committee manager, to manager of the Schools Sector for the Italian Rowing Federation and to the organisational manager of major international and national rowing events. One of the most important figures in the development of Coastal Rowing in Italy. Director in an important Italian banking group with particular professional skills and responsibilities in credit, finance, balance, budgets, legal and commercial areas. 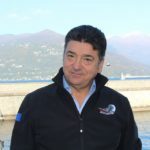 From 2013 to 2017 General Manager of the Varese Organising Committee for the World Rowing events. President of Canottieri Luino rowing club. Also Council member of the Lombardy Regional Committee of the Italian Rowing Federation. Lived in Italy for over 25 years. Started rowing at Canottieri Varese following in daughters’ footsteps nearly 15 years ago. Club member and contact for visiting teams/clubs who book training camps in Varese. Since 2010 involved in the organisation of all the major international rowing events held in Varese and coastal rowing events on Lake Maggiore. From 2012 to 2017 Assistant to the General Manager of the Varese Organising Committee for the World Rowing ​events. Honorary Member of the Italian Rowing Federation. 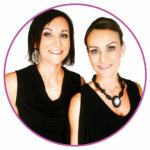 Wendy and Tim are the owners of Virtual Contacts, a niche consulting company that focuses on organization turnarounds. In addition to this they manufacture coastal and recreational boats for the African market and are the local agent for Braca Sport and Schroeder Rowing Service. Wendy holds an MBA and Tim a doctorate in Economics. They have worked extensively in construction, fast moving consumer goods, automotive and higher education. Tim currently holds an honorary research appointment in the Faculty of Engineering and the Built Environment at Wits University. 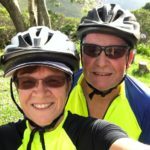 Both have extensive rowing experience having rowed for a combined 60 years, both representing South Africa, Wendy as a lightweight and Tim as coach of the womens squad. They both have won many national titles in various boats at various levels and currently are active oarsmen having competed at two world masters regattas and have rowed widely in Europe in amongst other events, Rallye du Canal Du Midi having won the double in 2005 and finished third in the youlette in 2014 and led tours to the race 4 times. They have pioneered recreational and coastal rowing in South Africa, with tours in Gauteng, Mpumalanga, Limpopo and Namibia, and hosted the Rowing the World tour in the Eastern Cape in 2016. Wendy and Tim operate in Eastern Cape from their property in Jefferies Bay and are renowned for their high quality of equipment and service. 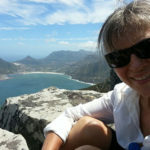 Anna-Marie is an accredited Western Cape Cultural tourist guide following her passion for tourism and rowing in Cape Town. 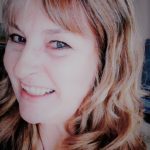 Originally from Johannesburg, her career in corporate and incentive travel, media communications, marketing and advertising, and freelance writing has taken her across South Africa to both the Western and Eastern Cape. At Cape to Point Private Tours, she offers customised activities to those who share her love of the natural outdoors, local culture, heritage, good food and wine. Anna-Marie has enjoyed a coastal lifestyle in Cape Town for over 30 years, and holds family and casual memberships at False Bay Yacht Club, Cape Coastal and Alfred Rowing Clubs. 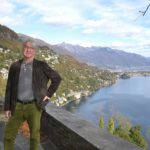 Hans-Jürgen was a competitive rower in his early days in Germany and has re-discovered the more leisurely tour rowing a few years ago. Today based in Switzerland he is an active member of one of the rowing clubs around Lake Zürich. He spends the summer months in Ireland’s Southwest frequently ‘testing the waters’ in County Cork. During Spring and Fall he is involved in tours on the many rivers in Germany’s Rhineland region. Nancy started rowing in 2010, the summer that Rowing PEI was launched. 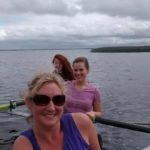 She is a trained coach, club administrator and was proud to be manager of the PEI rowing team at the 2017 Canada Games. 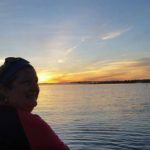 With 30 plus years as a reporter and producer at the Canadian Broadcasting Corporation or CBC, she loves to spread the word about rowing, especially coastal rowing. Nancy is co-chair of the Red Island Regatta which is held in August at Brudenell, PEI, a combined sprint and coastal event. She looks forward to hosting visiting rowers on her beautiful Island. www.rowingpei.ca. Jen was born in Zambia and lived in various parts of Southern and South Africa for 9 years before her family returned to Ireland to finish her schooling. Jen was a keen field hockey player in school and took up rowing as a mature student at NUI Galway where she signed up as a Novice. She competed with the University Club from 2006 until 2010 and then set up an Alumni Programme to attract former oarspeople and adult newcomers to the sport. The Alumni Club has grown from strength to strength since 2015 and offers both recreational and competitive rowing programmes to alumni and staff alike. Over the past 3 years, Jen was involved with Rowing Ireland’s Get Going Get Rowing School’s programme where she introduced over 3,000 schoolgoers to the sport of rowing. Jen and her former varsity crewmates reunited again last year and trained to compete at the World Rowing Masters Regatta in Lake Bled. 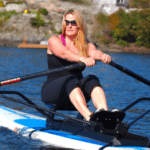 Jen is very keen to explore as much of Ireland’s inland and coastal surrounds and hopes to take this on as a new rowing challenge for the coming years. Born in France to a Canadian mother and French father, Julien grew up in Angers. After competing for France at the World Championships and two Olympic Games, which included winning the bronze medal in Beijing, 2008, Julien turned to ocean rowing. In 2013, he rowed across one of the most challenging bodies of water on Earth: the Atlantic Ocean. After a successful, yet harrowing 49-day crossing, Julien went back to calmer water. 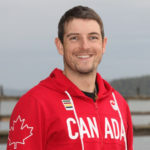 Permanently crossing the ocean this time, it was in Canada that the next chapter of his adventure was written, and in 2014, he moved to Canada with his wife Katie and joined Canada’s National Rowing Team. In 2015, Julien experienced a major medical setback, and was told he would never compete again. However, through intensive rehabilitation, he defied medical opinion by going on to compete one final time in the 2016 Rio Olympic Games. In 2018, Julien co-organized the 2018 World Rowing Coastal Championships in Victoria, Canada and won the Men’s Double Scull with his brother-in-law. 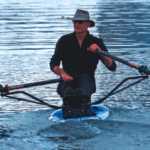 He now lives with his family on a small island off Vancouver Island, and, together with his wife, he guides coastal rowing tours in the Gulf Islands.